While I AM passionate about my nearly three-year-old blog (revamped from a design website), I’m much giddier about a supportive community that helps fuel my desire to head to my desk each day and create a variety of content. Believe it or not, it all started with a tweet. And if you don’t believe me, read on. Having posts commented on, Facebook ‘liked’, Google+’d, re-tweeted and spread via word of mouth is a blessing that I don’t take for granted. So in the spirit of the season of giving, to all my faithful readers who’ve shown support for my little labour of love in 2012, I’ve a sweet little giveaway! All Twitter entries will need to be following @arianecdesign as I will send a DM if you win via Twitter! I’ll select a winner at random on Wednesday, December 19 at 2 pm. Thank you all for a wonderful year of reading, commenting on, and sharing my Vancouver reviews, design viewpoints, experiences (and beyond)! Friday the Lucky 13th Kobo Touch Contest! My favourite holiday past time is celebrating “Sinter Klaas” December 5th & 6th and watching World Junior Hockey with my dad between Christmas & New Year! My favorite holiday tradition is watching Christmas movies. Especially the fluffy made for TV ones! I love going snoeshoeing during the holidays! My favorite holiday pastime is opening presents under the tree on Christmas morning! My favourite holiday past time is simply celebrating with my brother and sister. There is nothing I cherish more than good food and drink with my family. My favourite holiday past time is going out to pick our perfect Christmas tree and coming home to decorate it….love it!!! My favorite holiday past time is watching holiday movies in front of a fireplace. Spending time with my family, relaxing! My favorite holiday past time is baking! I love gingerbread cookies, especially the cute ones that are decorated and shortbread. I love looking for recipes; I find baking to be so relaxing (especially when it all turns out) and it is my fave holiday pastime. 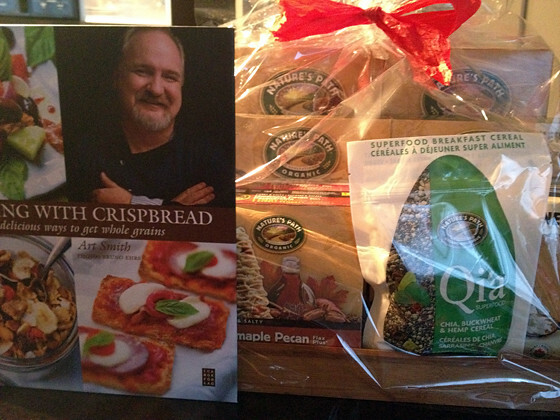 Thanks for the chance to win fantastic healthy prizes!